Spring is a busy time for flea markets. It’s the best time to find antiques and collectibles that dealers discovered during the winter. And it’s a great time to get out and enjoy the bustling hunt for vintage furniture, clothing and jewelry. Kovels has compiled a list of spring flea markets that are well worth a trip. Each of the 9 markets is renowned for its variety of items, negotiable prices, popularity among both vendors and shoppers across the U.S. and great food. Kovels’ Top 9 are listed below, with details on each flea market. 490 Danbury Rd. (Rte. 7 / 202), New Milford, Conn.
Every Sunday beginning March 25, 2018, through mid-December, including Sundays on all holiday weekends. The Elephant’s Trunk Country Flea Market season opens their 2018 season on March 25. Treasure hunters, antiques collectors, up-cyclers, farmers and foodies have been flocking to “The Trunk” since 1976. The early years found dealers set up on the lawn in front of the 19th century Victorian house, which faces Route 7. More than 40 years later, it has become a popular New England tradition. Typical Sundays feature over 500 vendors and an ever-changing mixture of food trucks from all over the east coast. Visitors love its Americana treasures, art, vintage furnishings and cold watermelon sold by the slice. “Regular buyers” are admitted at 7:00 a.m. for a $2 admission fee, “early buyers” at 5:45 a.m. for $20, and super-early buyers at 4:45 a.m. for $40. Many treasures await on the field but leave Fido at home – no pets are allowed. Everything is bigger in Texas and its premier flea market is no exception. Spring and Fall Antiques Fairs are held during the week that ends on the first Saturdays of April and October each year. This year it runs from April 2 through 7. It’s a giant marketplace with 100 percent antique and vintage merchandise, attracting thousands of dealers and tens of thousands of buyers from around the world. There are four locations in Round Top – the Big Red Barn, Big Red Barn Tent, Continental Tent and Carmine Dance Hall. Admission is $10, $20 for a VIP early shopping pass. Parking is free. Find American and European antiques, vintage decorator items and collectibles, all kinds of art, glass, signs, toys, clothes, jewelry, architectural and repurposed items, and much more. There are also more than 50 other shows that start March 22 and run through April 8 in neighboring communities (like Warrenton, Carmine and Shelby) within about 15 miles of Round Top, mostly along Highway 237. Interested? Contact the Round Top Chamber of Commerce or the City of Warrenton. Friday 8 a.m. to 5p.m., Saturday 7 a.m. to 6 p.m., Sunday 7 a.m. to 4 p.m. The Nashville Flea Market is considered to be one of the top ten flea markets in the country. It’s been operating for almost 60 years. With an average of 2,000 booths, dealers and vendors from 30 states offer items every month. It advertises a huge and unique selection of antique furniture, dishware, clothing, rugs, jewelry, leather goods, more, as well as specialty foods. One thing that sets the Nashville Flea Market apart from other flea markets is its monthly themes. Past themes have included things like retro revival, romance junkies, down memory lane, vintage galore, Americana cool and old-school rules. Admission is free. This gathering on the second Sunday of every month is considered one of the best on the West Coast. It attracts as many as 2,500 vendors and 20,000 shoppers. Find clothes, shoes, jewelry, sunglasses, ceramics, glass, furniture, pictures, crafts, keepsakes, art, fabric, bikes, costumes, music — every imaginable type of merchandise. It’s open rain or shine. Admission: Special preview VIP admission from 5:00am - 7:00am at $20.00 per person; early admission from 7:00am - 8:00am at $15.00; and regular admission at 9:00 is $9.00. Children under 12 are free with an adult. No credit cards. There’s no admission after 3 p.m., plenty of free parking, lots of food from cheeseburgers to sushi, and even celebrity sightings. The Long Beach Antique Market calls itself “The Flea Market with Style.” Over 800 sellers feature a huge selection of antiques, collectibles and everything chic, cheap, unique and vintage, all at bargain prices. Find collectibles, home decor, jewelry, furniture, vintage clothing and more. The sale is spread out over 20 acres at the Veterans Stadium in Long Beach. Come rain or shine. Admission 6:30 until 2:30 is $6.00; early admission from 5:30 to 6:30 a.m., $12; children under 12 are free. There’s food and free parking, too. Renninger’s Kutztown hosts a flea market extravaganza three times a year, April, June and September. The extravaganza is set up behind Renninger’s Antique & Farmer’s Market, with exhibitors outside, under tents and in two 350-foot long pavilions. The Indoor Antique Market and the Indoor Farmer's Market are also open during the Extravaganza. Admission is $10 on Thursday, $6 on Friday and $4 on Saturday. Dress for all weather; the show runs rain or shine. Saturday 8 a.m. to 5 p.m., Sunday 9 a.m. to 4 p.m. The Springfield Antiques Show and Flea Market has been called “One of America’s Best” by CNN and some top publications. Held 9 times a year at the Clark County Fairgrounds in Springfield, Ohio, it is known for a vast selection of antique and vintage items, as well as midcentury modern pieces. In addition to the regular shows, there are Extravaganza weekends in May and September that feature over 2,000 vendors, 20,000 customers and lots and lots of food. They pride themselves on a unique mix, saying to “expect the unexpected” vintage, antique, re- & up-cycled, and artisanal goods. Sat. 9 a.m. to 6 p.m., Sun. 11 a.m. to 5 p.m. The D.C. Flea is the mid-Atlantic’s largest indoor antiques and collectibles flea market. Shop for anything from fine antiques to vintage clothing and accessories at over 700 booths in two huge halls. Dealers showcase a wide variety of merchandise including porcelain, glass, silver, jewelry, collectibles from all eras, art and lots of midcentury modern. Admission, $10, is valid for the whole weekend. Also, in the North Hall of the Expo Center, check out the Washington D.C. Modernism Show & Sale. Make your way to central Massachusetts to visit the market that attracts over 50,000 people three times a year. The six-day Brimfield Flea Market hosts Tuesday-through-Sunday shows each year in May, July, and September. Over twenty independent fields of dealers make up the market, and they have a staggered opening and closing schedule. Some fields have an admission fee of about $5 but most are free. This large market, stretching along a mile on both sides of Route 20, is an exciting tradition that attracts visitors from many states and countries. Spring flea markets await thousands of antique enthusiasts and collectors – be sure to plan your visit soon. 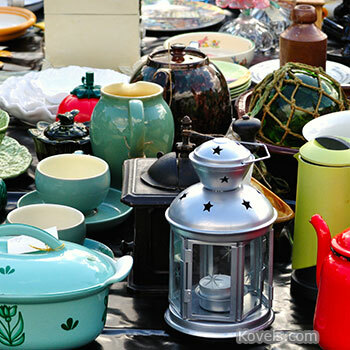 Kovels.com has more information and tips on navigating flea markets, negotiating smart deals and identifying original objects. Kovels’ booklet, Flea Market Strategies: How to Shop, Buy, and Bargain the 21st-Century Way, has tips on what to wear, what to bring along and how to negotiate. Also included, tips on spotting fakes, advice on how to pay for purchases, and a list of the latest smartphone apps to help buyers shop, share and ship. Available at KovelsOnlineStore.com. Do you know of any good Flea Markets scheduled in the Pacic NW.. Oregon, Wash. I know of 2 Major antique flea markets: The Long Beach Flea/Antiques Market and Pasadena Rose Bowl Swap Meet. I've heard there's a good one in AZ I'm sure the Northwest must have some great ones too. Please research places for the other 41 states you left out! Whomever compiled this list needs to look at a map of the U.S. Six markets are on the east coast, one in Texas. There are 41 more states in the Continental US, and believe it or not, we like flea markets, too. Unless those of us west of the Mississippi want to drive for days, there is nothing on this list for us. My impression of the list is that it contains those places familiar to the author, who apparently doesn't travel far. Even Texas is thousands of mile from anyone on the West Coast. Hint: SoCal has a huge flea market. Why isn't that on the list? On the Brimfield show you say it is a 6 day show running May 9 to 13. That is only 5 days although it does say Tuesday thru Sunday which is May 8. Is the show May 8 to May 13? The biggest, best and long-time (over 50 years) indoor annual white elephant sale benefitting the Oakland Museum of California was just held on 3/3 and 3/4/18. Wait 'til next year!